When you’re seeking funding for your business, whether it’s via direct investment or securing a business loan, you’re going to run directly into one of the biggest problems in our economy today: the certainty challenge. A lot of people were burned very badly in the events that contributed to the recession. Even now, through the first unsteady steps of recovery, we see significant hesitation in the markets. It’s understandable, and even desirable, that we see more cautious thinking, but it can be difficult to secure funding in this environment. What investors and lenders are looking for is certainty. They want to know ahead of time — to be absolutely certain — that they’re making a smart move with their money. They’re going to turn to you for meaningful proof that you’ll be successful. Bankers and investors want the ability to predict, with a high degree of certainty, what is going to happen tomorrow. As a business owner and entrepreneur, you’re in the same position. Being able to tell, ahead of time, what your customers want, when they’re going to want it, and how they want it delivered provides you with a significant competitive advantage. It’s not, really. Dominant organizations, such as Apple, Nike, and Ikea, do it all the time. In Customers First: Dominate Your Market By Winning Them Over Where It Counts The Most we break out how, via a process called Brand Modeling, it becomes possible to predict with an extremely high degree of confidence, how your customers are going to respond to everything you do as an organization. 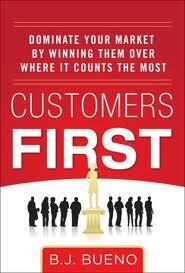 This begins by putting your customers first. Developing a deep, comprehensive understanding of who your best customers are, and what motivates them to act in the way they do, has many benefits. It’s important to remember that 90% of all human behavior is unconscious. We’re all motivated by powerful cultural, social, and psychological factors that influence our choices, whether we know it or not. Brand Modeling is the process of identifying and understanding those factors in order to create products, services, and messaging that your market will find highly personally relevant and desirable. This has an obvious immediate positive impact on your company’s bottom line, and, if used strategically to build and strengthen consumer relationships, will deliver huge dividends in terms of brand loyalty. Any organization can do this, and those businesses that wish to survive and thrive in this tough economic environment must do it. A high level of meaningful customer knowledge allows your organization to become more efficient and effective at reaching your customers. This efficiency enhances your profitability, and makes you a more attractive prospect for investors and lenders alike. They benefit from the power of predictability, and so do you. That’s the value in putting customers first.